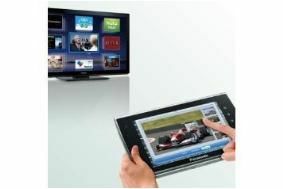 CES 2011: Panasonic developing VIERA Tablets | What Hi-Fi? Described, rather unusually, as a 'smart terminal', Panasonic sees its VIERA Tablet very much as a little brother to its internet-connnected TVs, not only because it will share a number of features and services with them, but also because it wil be able to display images and information relating to what you're watching on your main screen. Available in a number of sizes between 4in and 10in, the device will access cloud-based services such as video streaming and ebooks, and it will undoubtedly benefit from the opening up of the VIERA Connect platform to third-party developers, which has also been announced at CES. Panasonic is also promising that the VIERA Tablet will be slim and lightweight, and will offer 'long hours of operation' when it launches later this year. Look out for our hands-on with the device in the blogs section later this week.